Each spring at NOTY, we experience the Five Stages of Name. First is anticipation. The mere prospect of moniker upon magic moniker triggers paroxysms of delight: Tis the night before Dionte Christmas. But then fear sets in. What if this is the year without a Barkevious Mingo, a Destiny Frankenstein, a Vanilla Dong? 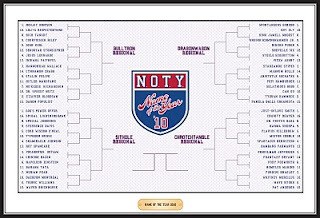 What if this year’s NOTY doesn’t live up to the glory of the past? The fear subsides when we crack open the inbox -- it used to be a manila folder -- and peruse the names we’ve stored and ignored for months. Relief. We are Columbus sighting land. Armstrong setting boot on moon. Prometheus discovering fire. And if Prometheus’s last name is -- well, if it’s anything, really -- we are stoked. Panic is next. How many emails? Five hundred? Six hundred? A thousand? How many names to verify? Price and Waterhouse, it turns out, are unavailable during tax season. 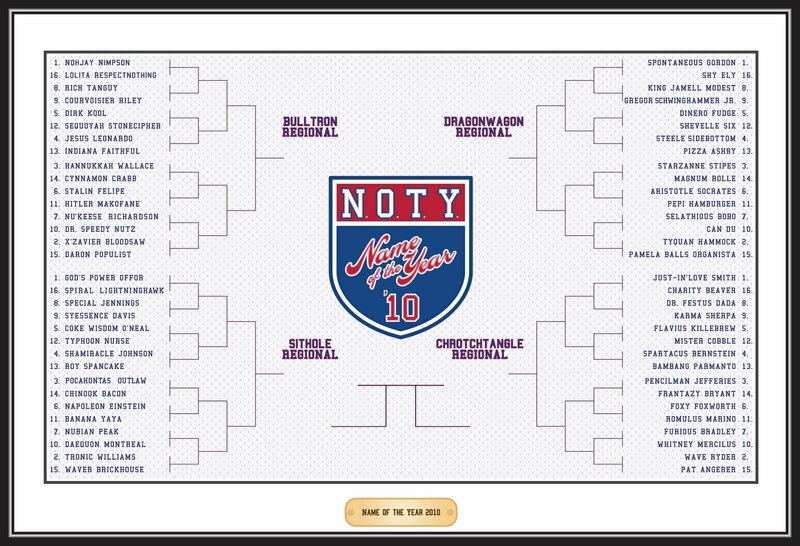 (Send applications for 2011 NOTY Intern to nameoftheyear@gmail.com.) It seems an impossible task, clearing the onomastic Augean Stables, separating the DeJuan Wheat from the Rick Chaff. But we click and click. And chortle and guffaw. And finish. Earlier we mentioned 278 nominees. Well, we accepted another five; good to have you, ShaMiracle Johnson. Four others were excised. Nicknames are out, Tiny Gallon and Munchie Legaux. And you, Gelo Orange? Fourteenth place in 2007 wasn’t good enough? And then we took the final 279 and we gathered -- this year, sadly, only two of us -- just blocks from the Supreme Court, in the event of an emergency cert petition for ballot inclusion. 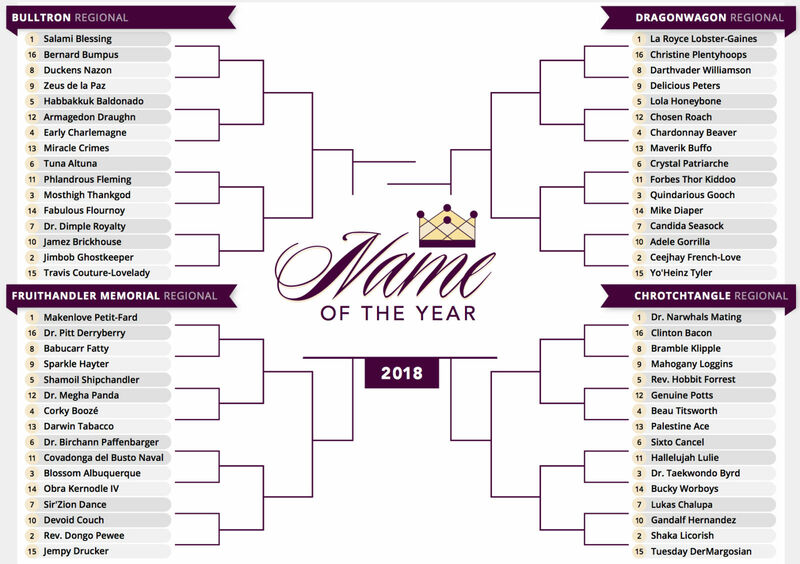 For three hours, we laughed and cried and dinged and whittled the field first down to 120 or so and then to the final 64 you’re probably reading instead of this. Pride. Joy. Accomplishment. 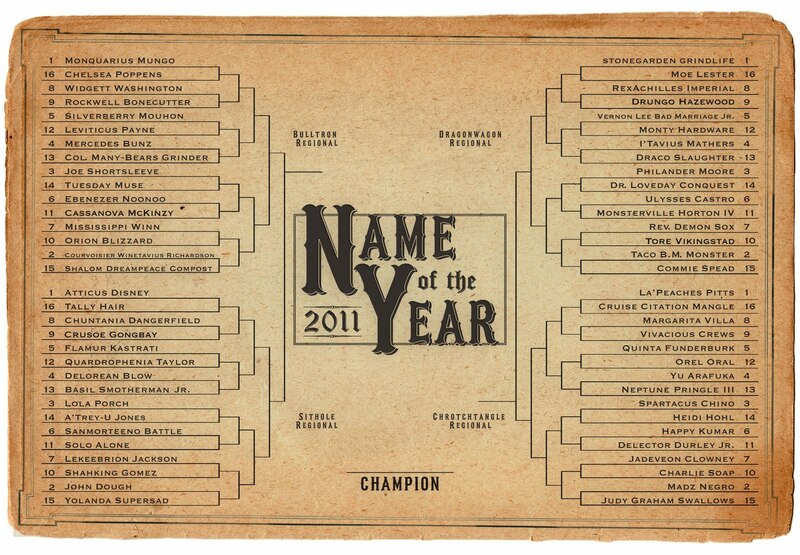 Anticipation again: Who will be the 2010 Name of the Year? Yes, we know, that last stage included four emotions. Whatever. 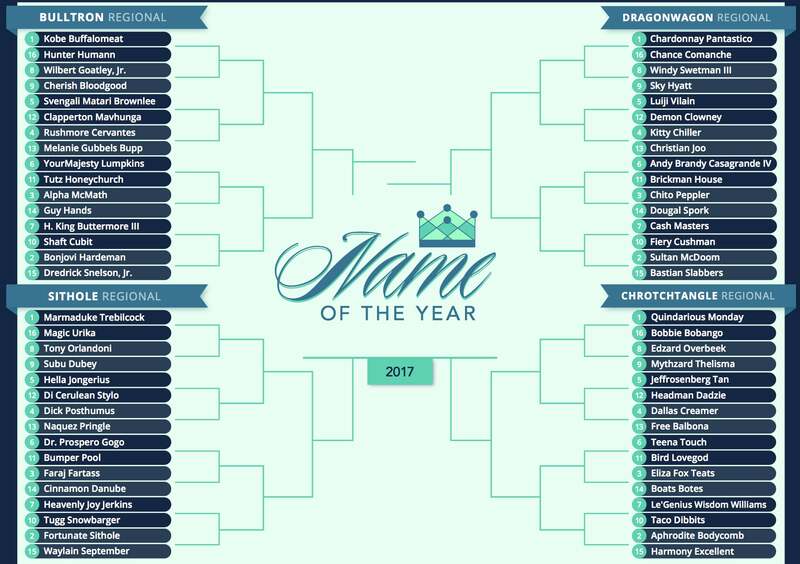 Here's the ballot in printable form. It's part Pennsylvania Quakers, part David Letterman, all retro, all Bulltron Regional No. 5 seed Dirk Kool. Study. Analyze. Enjoy. Prepare to exercise your democratic freedom. A round of applause for twoeightnine design for this year's brilliant logo and ballot. Who Will Be the Next Mingo?